Windows users have long been envious of Apple’s “GarageBand” for the Mac, which makes it easy to create your own music. 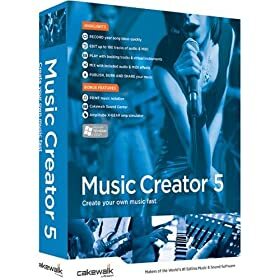 With that in mind, the folks at Cakewalk.com have created a similar program, “Music Creator 5,” which is only $35 for Windows. The first time you start the program, it analyzes the music on your computer to personalize the program to your tastes. In our case, that meant analyzing about 900 items. You are not confined to using the styles if found in your own lists, however, but can mix and match as the spirit moves you. You can create and edit up to 160 tracks, taken either directly from audio (though a microphone) or a midi connection. Lots of other audio and midi tracks are already on the program’s disk and can be used in your own creations. Music Creator 5 has a “Cakewalk Sound Center,” which contains hundreds of sounds digitized from professional instruments and the “Roland TTS-1” synthesizer. You can post your playlists, along with a music player, directly to MySpace and other websites, transfer them to CDs, and print your compositions with musical notation. We could say there’s a lot of bang for your buck here, but that would just be for pun.